Adults and kids will enjoy this tasty dessert that combines chocolate plus other yummy ingredients. Prepare it and celebrate the best moments! Place cake on serving plate. Cut a 3/4-inch-thick horizontal slice from top of cake using serrated knife; set aside. With small sharp knife, cut a 1-inch wide and 1-inch deep tunnel around center of interior of cake, being careful to not cut through to bottom or side of cake. Remove cake cutout; reserve for snacking or another use. Pour milk into medium bowl. Add dry pudding mix. Beat with wire whisk 2 minutes or until well blended. Remove 1/2 cup of the pudding; place in medium bowl. Set aside. Spoon remaining pudding into tunnel of cake; cover with top of cake. Add whipped topping to reserved 1/2 cup pudding; stir with wire whisk until well blended. Spread onto top and side of cake. Refrigerate at least 1 hour before serving. Store leftover cake in refrigerator. 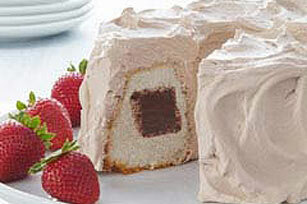 Serve this dessert with fresh strawberries for a special treat.